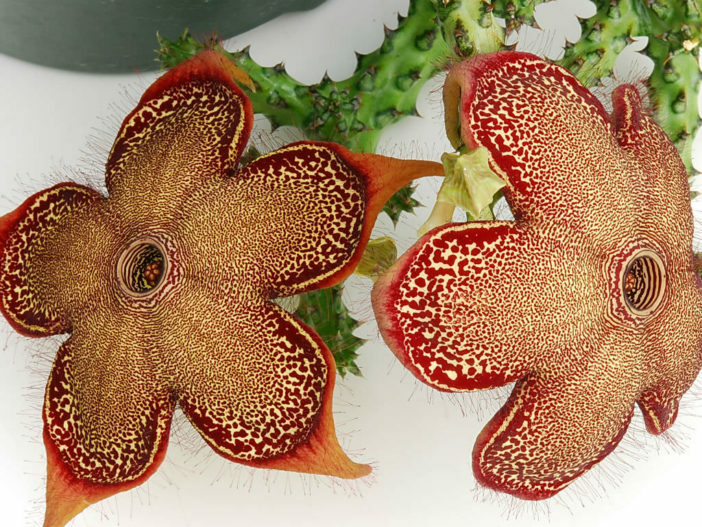 Edithcolea is a monotypic genus with a single species Edithcolea grandis, also known as Persian Carpet Flower. The genus is named after Miss Edith Cole (1859-1940). She collected the type material for this plant together with Mrs. Lort Philips in 1895, during a botanical expedition (1894-1895) led by Mr. Ethelbert Edward Lort Phillips (1857-1944) from Berbera to the Golis mountains in northern Somalia. Persian Carpet Flower is a succulent plant with remarkable flower, at times described as the Persian carpet flower. The carrion-like smell of the flowers attracts flies and other insects for pollination. The stem of Persian Carpet Flower is eaten as a vegetable in Ethiopia and Somalia. Light: Partial sun or light shade. Water: It requires moderately watering through the growing season but enjoy plenty of water and some fertilizer in hot weather and allow them to dry before watering again. This helps them to flower freely. Water sparingly in winter according to temperatures. But, as with most asclepiads, it is unwise to leave them wet in cold weather. Temperature: Winter care presents no problems at 60 °F (15° C) with plenty of light. Soil: Since roots are quite shallow, use a succulent mix or add extra perlite or pumice to regular soil potting soil. A gritty, very free-draining compost is suitable, and clay pots help the plants to dry out between watering. Easiest with stem cuttings. Allow cuttings to dry a day before planting. Stems must be laid (not buried) on gritty compost and will then root from the underside of the stems. It can also be increased from seeds sowing in spring in moist, sandy peat moss. They are very susceptible to stem and root mealy bugs, and damage from these may well initiate fungal attack. If you do have problems with a stem or with basal rotting, you can reliably isolate the healthy parts, dry them off, and re-root them in moist compost.